The latest red-hot romances from Mills & Boon Modern! Desert Prince’s Stolen Bride by Kate Hewitt Shy palace governess, Olivia Taylor, spends her life being overlooked. Until the night brooding Prince Zayed spirits her away! To reclaim his country, Zayed must wed his betrothed. But when it becomes clear that Olivia is the wrong bride, can they put their mistake right? 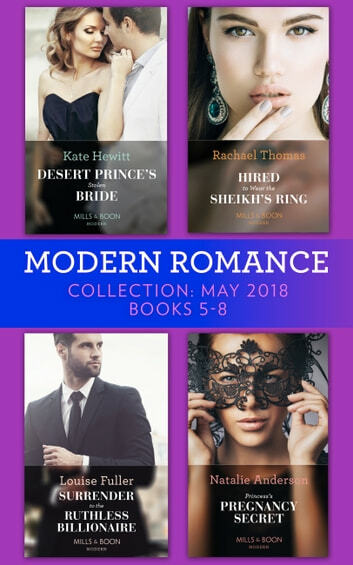 And with such heated chemistry between them, do they want to… Hired to Wear the Sheikh’s Ring by Rachael Thomas Tiffany is the perfect candidate to be Jafar Al-Shehri’s temporary wife. In return for meeting him at the altar, he’ll clear her sister’s debt. Yet this convenient arrangement to secure his crown soon leads to unbridled passion! But Jafar’s throne is still at stake – is their craving for each other enough to make Tiffany more than just the Sheikh’s hired bride…? Surrender to the Ruthless Billionaire by Louise Fuller Life has taught billionaire Luis that everyone has an ulterior motive. When the beautiful stranger he spent one scorching night with, reveals herself as his famous family’s new photographer, alarm bells start ringing! He whisks Cristina away to his island fortress, determined to isolate her and uncover the truth. Only to realise he’s rekindled a desire from which there is no escape! Princess’s Pregnancy Secret by Natalie Anderson Attending a royal masquerade, billionaire Damon can’t resist seducing a captivating guest. It’s the most shamelessly sensual encounter he’s ever had! Then Damon discovers that his masked beauty was actually Princess Eleni—and now she’s carrying his child. To protect Eleni from scandal, Damon must do the unthinkable, yet outrageously desirable: marry his pregnant Princess!